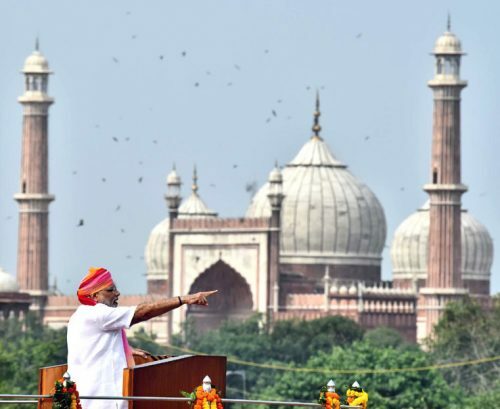 The Prime Minister, Shri Narendra Modi addressing the Nation on the occasion of 70th Independence Day from the ramparts of Red Fort, in Delhi on August 15, 2016. 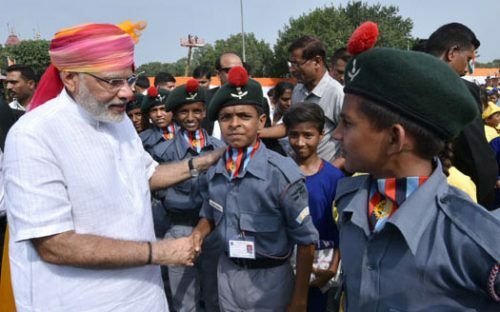 The Prime Minister, Shri Narendra Modi interacting with the school children after addressing the Nation on the occasion of 70th Independence Day, in Delhi on August 15, 2016. 18. 30,000-35,000 km of transmission lines used to be laid in the past. Now at least 50,000 km per day are being laid. 26. As we celebrate the 350th anniversary of Guru Gobind Singhji I remember what he said: “He who hasn’t served others, how can his hands be considered holy?” I say our farmers do such work and have sown 1.5 times the pulses that were down earlier, despite the discouragement of successive droughts. 27. Our scientists have created 171 types of high yielding variety seeds, so that we maximise output. I congratulate them. The shortage of fertiliser is like something out of a bad dream of the past. That shortage is history. 29. Government is continuity and if there are good points in the works done by them, we, with bowed heads will continue that work. I take meetings over Pragati systems, where we oversee 118 such programmes launched by previous governments but had run aground. 270 projects worth Rs. 10,000 crore had been stuck. This was criminal negligence and we have tried to move them forward. 30. When there is clarity in policy, clarity in intent, decisions are unhesitating. Every year, when it came to Uttar Pradesh, a common story was the arrears due to sugarcane farmers. Today, I can say 95 per cent of payments have been done. Under Ujjwala Yojana. we have 50 lakh households of smoke-filled kitchens.